... it's coming .. it's coming !!!! Happy Birthday to David & Yoke Soon ! ... and i'll be 25 in 2 days time! Haha .. Can't jez let them divert all the attention from my blog can't I ?! Major ADD (Attention Deficit Disorder) man !!! MAJOR !!! Weekend was a ... peaceful one I would say. Haven't had a chance to slack off at home for the longest time ever. And I had the whole Sunday to myself. Being a good Mom to my dear Son .. cleared up alot of outstanding work or WIP on my laptop .. organized my room .. organized my shoes .. watch DVD (OMG..I actually had time for DVD!). Saturday was a relaxed one as well .. Chilled out with a couple of old friends - and I really mean really really long time friends. I've known them like since I first set my foot in JB at the age of 10 .. and it's nice to know that we're all hanging out together till now! 15 years running! Yoke Soon .. now refered to as YS coz it's a hassle to type his name, "celebrated" his 23rd year of his life in Dolce. Packed, humid, sweaty, etc etc as usual .. he got really drunk .. etc etc etc .. must be really happy to have eh-hmm drinking with him. God knows when the whole conspiracy started but when the 2 of them together .. everyone became part of the papparazi team. - I have a more disgusting pic .. but I chose not to disgust people with it. Clue: Puke. Emelia Tan a.k.a. Byno Tan. I've always told her how fated we are to cross each other's paths. We have a long standing history in our friendship ... on and off ... and always end up together eventually again. 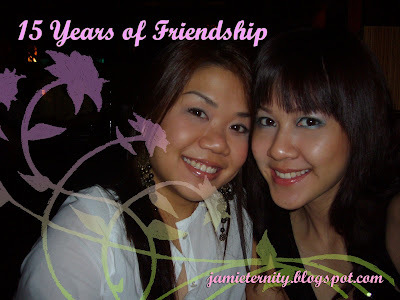 Since primary .. to secondary .. to our late teens .. early 20's .. and now .. mid-20s. Back and forth Dolce and Cabana ..not really happening or enjoying. Byno reckons we had more than our fair share of laughter in the afternoon that we've lost all the exhilaration to party that night .. after all, it's a birthday "party". Oh well .. just another night. The day I get more excited about my Birthday. 2 more days !!!! God knows why am I so excited. Isn't really that exciting for a woman though .. age is catching up .. and more naggings from relatives on "when are you gonna get married". It's kinda stupid coz whenever I go back to my hometown and meet these folks .. they'll interrogate me on my love-life and all. It'll be something like this .. Relatives: Gerrr .. so big liao .. when wanna get married? Got boyfriend or not? 2 more days ...... and I have already received me first Birthday prezzie! More reasons to feel extra elated !! And guess what .. it's actually off my Top 10 Birthday Wish List! And I thought that was an Top 10 Impossible Birthday Wish List. People do take my blog seriously! *claps in excitement* See..it pays to be a little thick skinned sometimes you know. Hahahaha~~~ Now I can start crossing off the wish list - well, guess only like 1-2 will crossed off and the rest will remain and carried over for the next decade before it's really realized. The day I realized that people do get younger the older they get. No joke about it. My parents seemed to get younger each day .. not physically .. but mentally. I'm yet to find the explanation to this phenomena but I have no qualms about it at all. Although it may get annoying at times. Gone were the days we're scared of them and always find the need to hide every damn thing we do from them ... now they wanna be a part of it. Few scenarios from my home sweet home to share ..
My dad's into Channel 76 on Astro ... to be exact E! Entertainment channel *sweats* And introduces me to the channel .. and we both hang out for hours watching the kaypohchi details of Hollywood. My mom's dancing non-stop .. and hanging out more often than I do. My mom keeps herself updated on my life .. she'll come to me everyday I get home and asks about what I did .. where I go .. details details details .. like my bestfriend would. She hangs out in my room .. pretending to be my galpals who stays over ..
On the other hand ... I HAVE THE COOLEST PARENTS ! Wished they started to be cooler when I was younger though. with Steph, Sharon and FangFang after a modelling gig in City Square. I don't have much pics from the event .. can see that I only manage to post 2 decent ones in my previous entree and I had to grab this one from Steph's friendster site. What d'ya guys think ... bangs or no bangs? Help me to decide whether should i start trimming it or let it grow out.